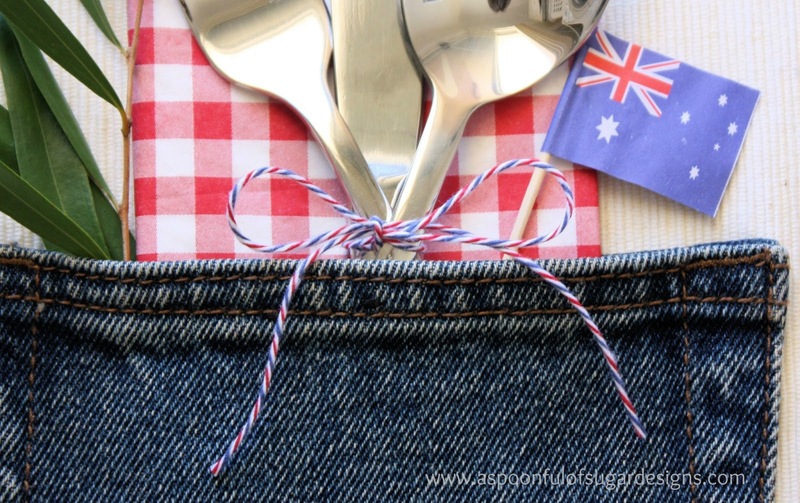 Australia Day on January 26 is usually celebrated with BBQ’s and picnics. In Perth we have a fabulous skyworks show set over the Swan River. We usually attend the fireworks with a picnic and enjoy all the free entertainment. 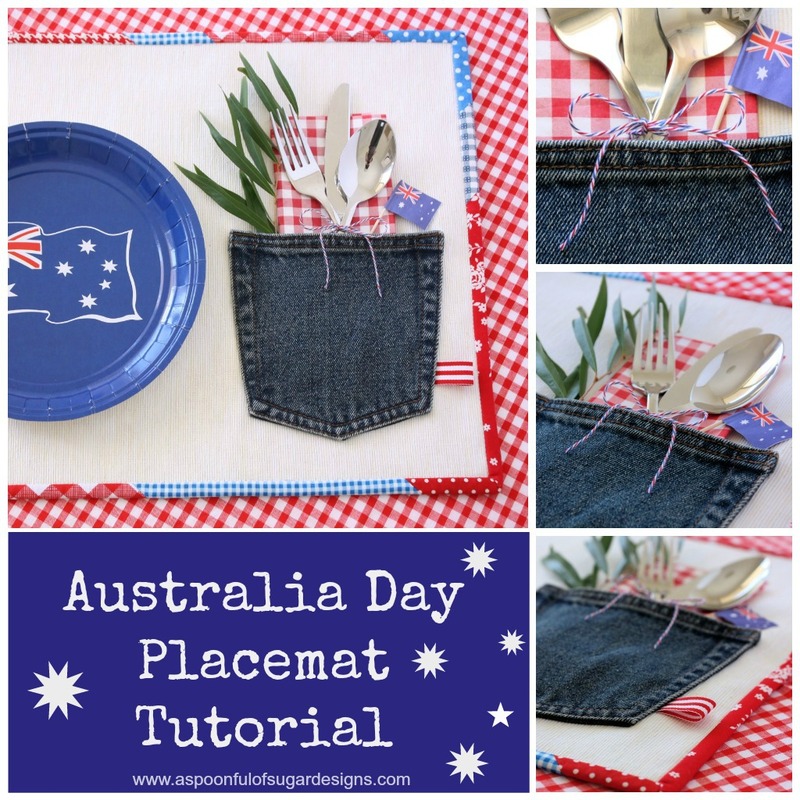 We have created a set of placemats in blue, white and red, perfect for our Australia Day celebrations. They have been made from some off white placemats (we used Marit placemats from Ikea ) that have been hemmed in a scrappy binding. 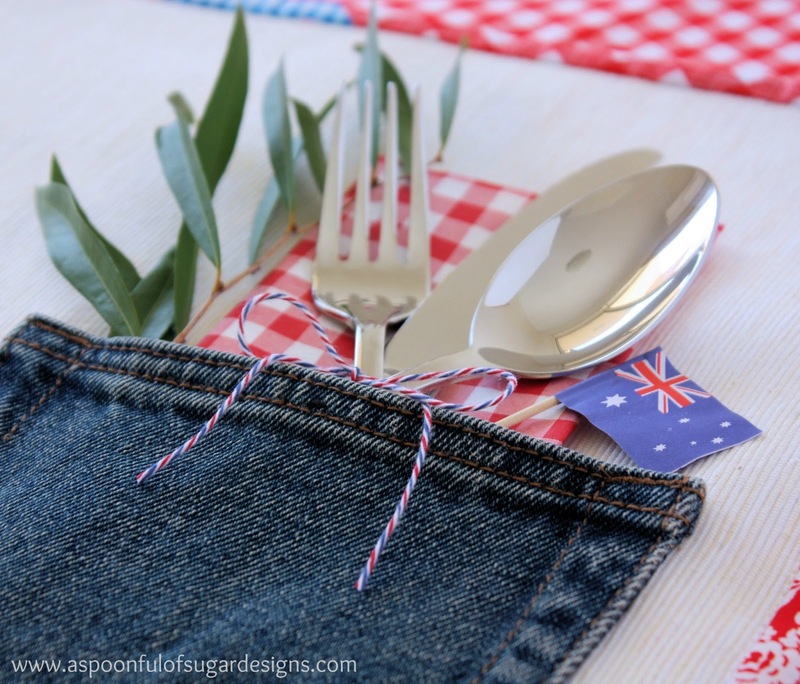 We have re-purposed a jeans pocket from an old pair of jeans, which is the perfect place to store cutlery, a serviette/napkin, and some eucalyptus leaves. We found some little Aussie toothpicks at the $2 shop, and added them to our pocket. 1. Cut the two hemmed edges off the placemat (as pictured) and overlock (serge) raw edges. 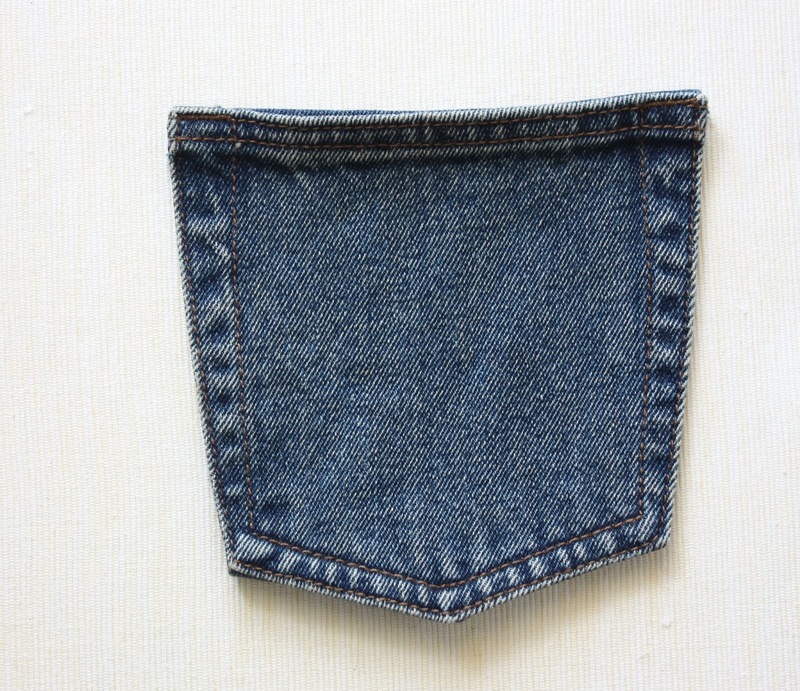 Cut a pocket from the back of the jeans, leaving 1/2 inch around the pocket. 2. Press the raw edge under the pocket. Position the pocket on the right hand side of the placemat and tuck a folded piece of striped ribbon under the right side of the pocket (refer to photo). 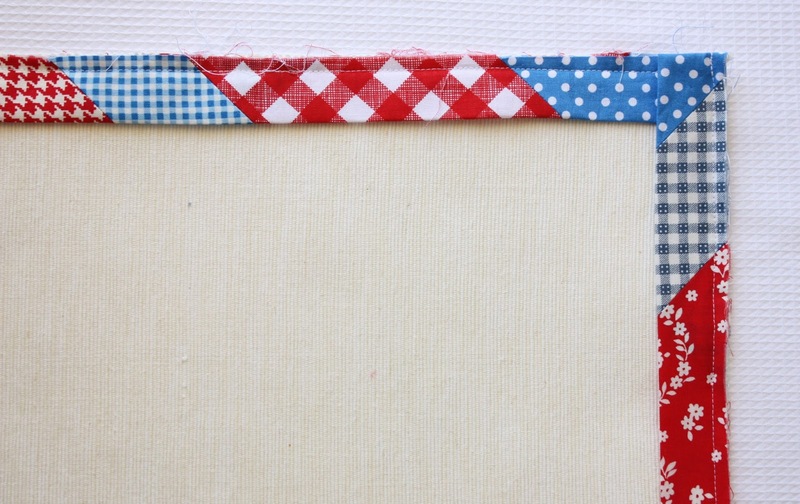 Stitch the pocket in place using your sewing machine on the sides and bottom of the pocket. Hand stitch the lining of the pocket to the placemat, leaving the opening free to store cutlery etc. 3. 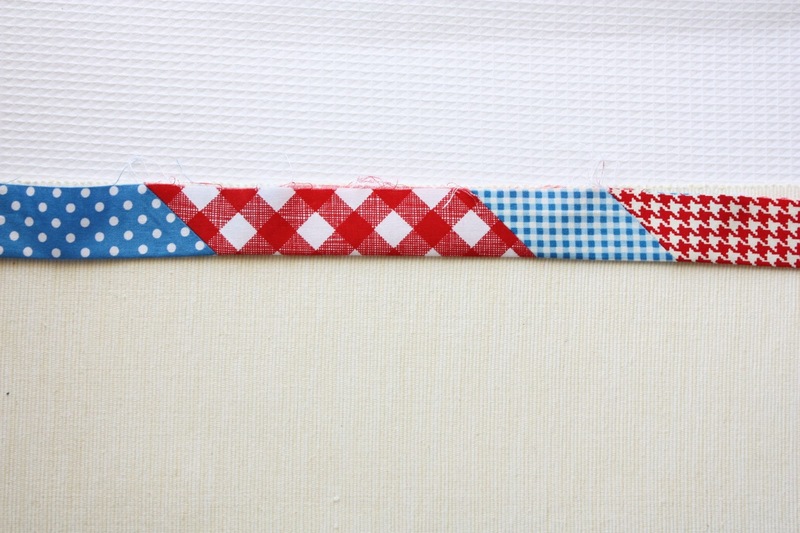 Cut the fabric scraps into pieces measuring 2 1/2 inch wide and into a variety of lengths measuring between 4 – 10 inches. Stitch the pieces together using a mitred join, until you have a long strip measuring approx 70 inches. Press the strip in half lengthwise. Pin around the outside of the placemat, as you would if it were a quilt. 4. Stitch the binding to the placemat, using mitred corners. (If you are not sure how to do this check out tutorials here and here). Add a serviette and cutlery to the pocket, tied with twine. 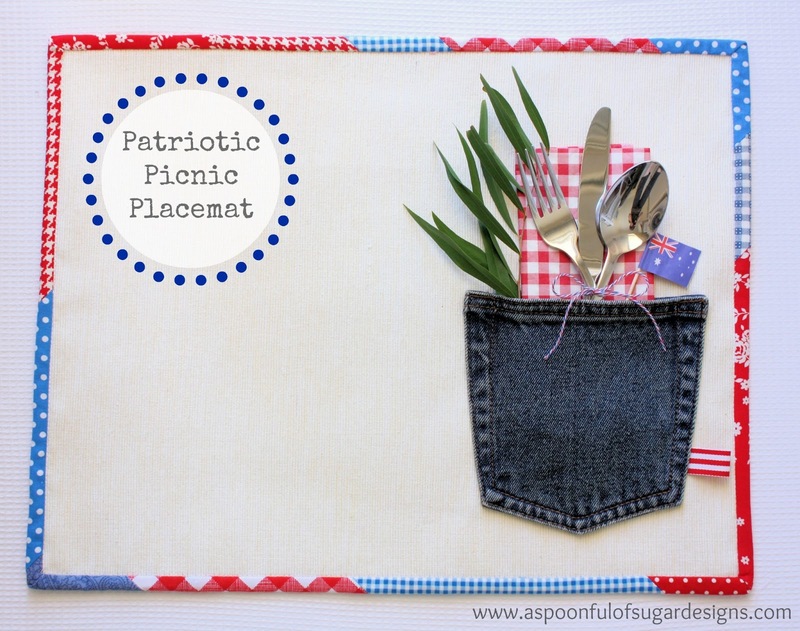 Add a eucalyptus sprig and a small Aussie flag. How fun! I didn’t realize that you celebrate a day similar to the 4th of July here in the States. You are so clever. What a fabulous idea. I love this 3-D look. Wonderful! 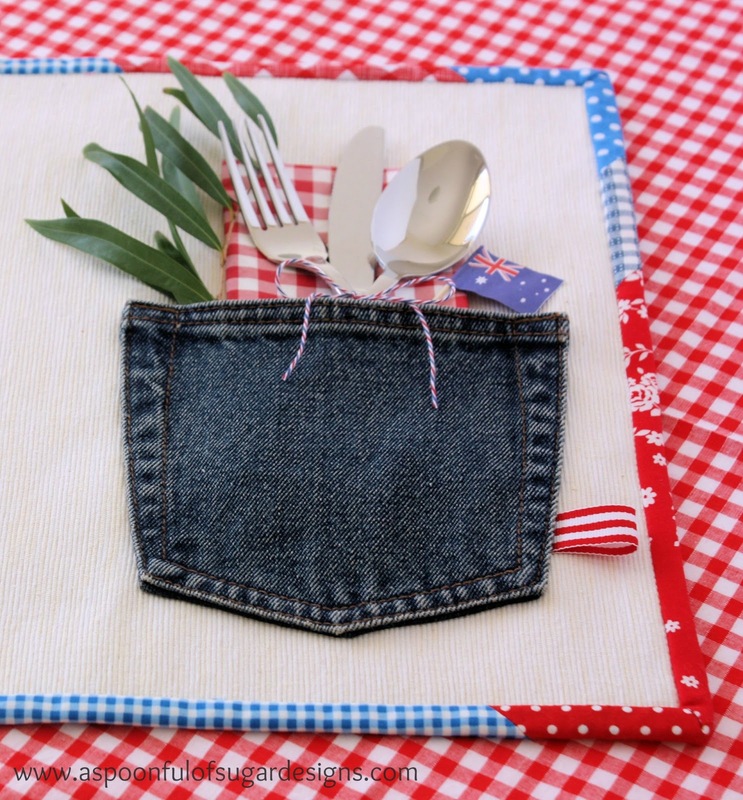 Dear Anonymous – Thanks for sharing the link to Cutlery Bag with Denim Pocket. It looks lovely – and it is always nice to find another inspiring blog. As it is in German it is not one we are familiar with. We always link to where we get our inspiration, and give credit where it is due. 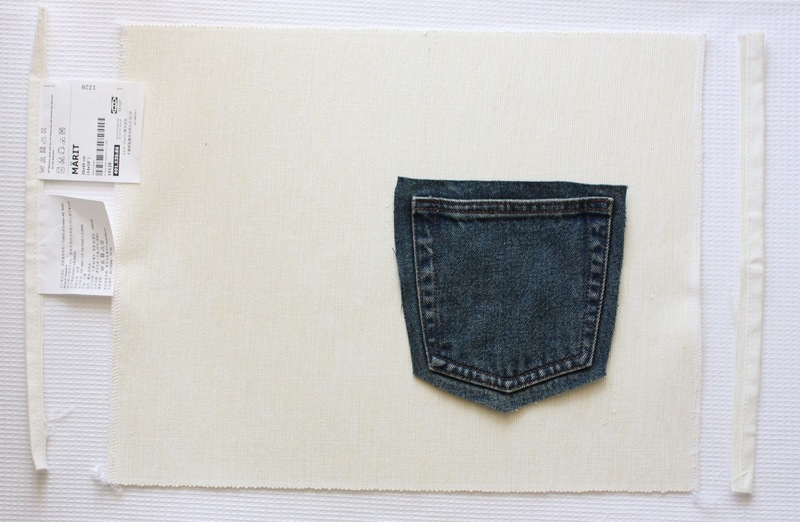 You will notice from the links at the end of our post that we have used denim pockets in some of our other projects a few years ago – so nothing new there. I just found your blog and I love your work with felt. 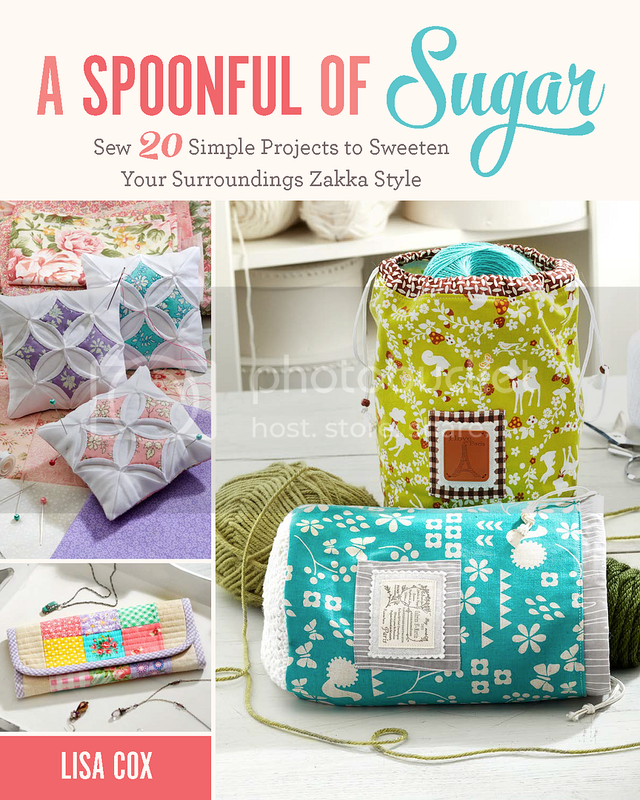 You have so many great projects! I would love you to stop by my blog on Tuesday. I am starting a link up for awesome projects like yours in the hope that more people can discover the projects we’ve all made and love. The link up is especially for older projects that we feel didn’t get enough attention. So stop by on Tuesday! Beautiful and great idea, tks for sharing, excellent for this super celebration!